During the 2011 Mississippi River Basin flood, the U.S. Geological Survey evaluated aspects of critical river infrastructure at the request of and in support of local, State, and Federal Agencies. Geotechnical and hydrographic data collected by the U.S. Geological Survey at numerous locations were able to provide needed information about 2011 flood effects to those managing the critical infrastructure. These data were collected and processed in a short time frame to provide managers the ability to make a timely evaluation of the safety of the infrastructure and, when needed, to take action to secure and protect critical infrastructure. Critical infrastructure surveyed by the U.S. Geological Survey included levees, bridges, pipeline crossings, power plant intakes and outlets, and an electrical transmission tower. Capacitively coupled resistivity data collected along the flood-protection levees surrounding the Omaha Public Power District Nebraska City power plant (Missouri River Levee Unit R573), mapped the near-subsurface electrical properties of the levee and the materials immediately below it. The near-subsurface maps provided a better understanding of the levee construction and the nature of the lithology beneath the levee. Comparison of the capacitively coupled resistivity surveys and soil borings indicated that low-resistivity value material composing the levee generally is associated with lean clay and silt to about 2 to 4 meters below the surface, overlying a more resistive layer associated with sand deposits. In general, the resistivity structure becomes more resistive to the south and the southern survey sections correlate well with the borehole data that indicate thinner clay and silt at the surface and thicker sand sequences at depth in these sections. With the resistivity data Omaha Public Power District could focus monitoring efforts on areas with higher resistivity values (coarser-grained deposits or more loosely compacted section), which typically are more prone to erosion or scour. Data collected from multibeam echosounder hydrographic surveys at selected bridges aided State agencies in evaluating the structural integrity of the bridges during the flood, by assessing the amount of scour present around piers and abutments. Hydrographic surveys of the riverbed detected scour depths ranging from zero (no scour) to approximately 5.8 meters in some areas adjacent to North Dakota bridge piers, zero to approximately 6 meters near bridge piers in Nebraska, and zero to approximately 10.4 meters near bridge piers in Missouri. Substructural support elements of some bridge piers in North Dakota, Nebraska, and Missouri that usually are buried were exposed to moving water and sediment. At five Missouri bridge piers the depth of scour left less than 1.8 meters of bed material between the bottom of the scour hole and bedrock. State agencies used this information along with bridge design and construction information to determine if reported scour depths would have a substantial effect on the stability of the structure. Multibeam echosounder hydrographic surveys of the riverbed near pipeline crossings did not detect exposed pipelines. However, analysis of the USGS survey data by pipeline companies aided in their evaluation of pipeline safety and led one company to further investigate the safety of their line and assisted another company in getting one offline pipeline back into operation. Multibeam echosounder hydrographic surveys of the banks, riverbed, and underwater infrastructure at Omaha Public Power District power plants documented the bed and scour conditions. These datasets were used by Omaha Public Power District to evaluate the effects that the flood had on operation, specifically to evaluate if scour during the peak of the flood or sediment deposition during the flood recession would affect the water intake structures. Hydrographic surveys at an Omaha Public Power District electrical transmission tower documented scour so that they could evaluate the structural integrity of the tower as well as have the information needed to make proper repairs after flood waters receded. 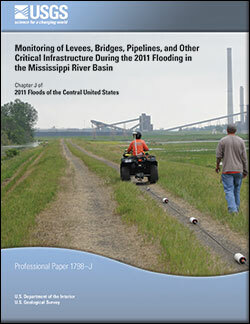 Densmore, B.K., Burton, B.L., Dietsch, B.J., Cannia, J.C., and Huizinga, R.J., 2014, Monitoring of levees, bridges, pipelines, and other critical infrastructure during the 2011 flooding in the Mississippi River Basin: U.S. Geological Survey Professional Paper 1798–J, 28 p., https://dx.doi.org/10.3133/pp1798J.